Church Nativity – Do You Need Some Help Choosing A Nativity Script? Click On The Appropriate Headings Below For The Specific Details To Open Up. - SUITABLE FOR SPECIAL NEEDS? The Alphabet Nativity Play : This is a very visual script which, although the nativity story is narrated, does not rely entirely upon the narration. Songs are included, but are optional. The script is written as an alphabet poem with 26 alphabetical key words, each represented by an illustrated letter which is displayed when the keyword is mentioned in the narration, and actions are included for the children to do to represent the word. The lack of necessary stage movement would make it ideal for a disabled group. Doing the actions as a group would be well suited to any individuals who don’t like the personal pressure or attention of a ‘performance’. Visual learners will find this script easier to connect with, as well as those with memory problems, as the illustrated letters act as a visual prompt and the Action Superstar can demonstrate for the group to copy. Ideal for including those with disabilities, hearing or sight impairments, as some of the parts are conducted from seats at the end of a row (Innkeepers who simply answer their door to speak when Joseph and Mary approach) meaning that the prompt literally approaches them as they sit in their audience seat. Perfect for those who find it hard to remember or to concentrate as a scripted on-stage director tells everyone where to go and what to do as part of the play. Young children can literally be guided by the hand as the director uniquely directs from ON-STAGE . The Simplest Nativity Play Ever : This play can be performed with any size cast and with little or no rehearsal as the concept is so simple. No songs are included but hymns for the congregation to sing are suggested at the appropriate points. An instructor literally tells the actors what to do and when and where (all in rhyme and rhythm as part of the script), and each character is introduced by the narrator with an obvious prompt such as “The Innkeeper listened while Joseph said…..”. This script is therefore ideal for young children or those with memory problems, as nothing needs to be remembered, although they do need to pay attention to the play to listen for their instructions. Some parts are included that can be performed from seats on the end of rows (such as Innkeepers and Bethlehem residents who simply answer their doors to speak when Joseph and Mary approach and knock on them) making it ideal for inclusion of those with disabilities, or hearing or sight impairments, as the prompt literally comes to their seat. The script works for those that are shy, nervous, or prone to stage fright as the narrator can continue with the actor’s lines as an uninterrupted part of the story if the actor doesn’t speak. In the same way, this helps when including someone who cannot commit to rehearsals or to being present on the day. All of my scripts, by using rhyme and rhythm and short speaking parts, make it more feasible for non-confident readers to take part knowing that the lines take very little memorising. That Wonderful God-given First Christmas Day: This script is more specifically a nativity service including the story of Jesus’s birth read directly from the appropriate bible passages. These are then re-iterated when a storyteller introduces a scene and character in rhyme. The character comes onto stage to say a couple of rhyming lines before joining the stable scene to build up a live tableau. This script is therefore ideal for young children or those with memory problems, as nothing needs to be remembered (script prompt cards are pre-prepared ready to print on card for the cast to use if required.) However, should you choose to memorise the parts, the rhyming is a great help, and the lines are evenly shared between small speaking parts. It is ideal for inclusion of those with disabilities, or hearing or sight impairments. The actors dress up and speak a couple of lines to the audience from wherever you choose, and little or no interaction is required with other characters. These characters/ scenes are very clearly introduced by the story teller after the relevant bible reading. The script works for those that are shy, nervous, or prone to stage fright as there is so little for each character to say, but script cards are even provided to read from on the day if you prefer. This is makes the play very flexible in accommodating someone who cannot commit to rehearsals or to being present on the day. The Alphabet Nativity Play is also an option but does not include many speaking parts. The concept of this play is for the narrator to read the story (which is in the form of an Alphabet Poem and highlights 26 keywords in alphabetical order). When the keywords are mentioned, pictures are displayed and actions done for each word. Meanwhile, there is the option of some interaction with the audience in the form of an ‘Instructor’, a kind of pantomime style character who speaks to the audience and holds up signs for them to say in response. 9 simple songs are included. Hence, the play can involve large groups of children doing actions, songs and potentially walk on parts without lines, and is particularly good for special needs groups etc. Scripts without music, intended for you to use your own or for you to include congregational hymns/carols, some of which are suggested but not provided for you. Up to 16 speaking parts (averaging 1 or 2 rhyming couplets) these being Mary, Joseph, Angel Gabriel, Angel 2, Angel 3, Emperor Caesar, Roman Soldier, Innkeeper, 3 shepherds, 3 kings, King Herod and a star. The Donkey’s Christmas Play : Although written with enough lines for 23 parts, only 9 parts are crucial to keeping the script at the same lengths, as the lines can be shared out or said by the narrator. As few children as 2 Yes, really! The Story of Christmas This script is written to be narrated entirely as a story with the option of actors saying their own lines, or of a voice-over saying the lines that there are no actors for. Includes the option of members of the congregation standing and saying lines from their seats, which is a great, fun way to ensure that ANY church can do this nativity. The DIY Nativity Play Our 7 older children/ teenagers loved this script as they narrated and led the service, all in rhyme, giving instructions to the congregation and coaxing volunteer adults to join in.….The relevant mockery is all scripted too! The few younger children we had loved their role within the cast of ‘setting the example of how to play the part.’ No music is included with this script as you use congregational hymns at the appropriate points. The Alphabet Nativity play : An entirely narrated script, written as a visual alphabet poem, which can be used effectively with or without actors, and can literally be ‘performed’ by displaying the included pictures of the 26 alphabetical keywords mentioned in the narration and/ or doing actions to each one. There is a great option to include some fun audience participation by including the optional ‘instructor’ who talks to the audience in a ‘pantomime’ style and holds up signs telling them what to respond with. Suggestions for an especially small cast: why not use appropriate pictures (eg, Roman Soldier etc) on a powerpoint or held aloft as the storytellers introduces the scene, and simply use a voiceover to say the character’s lines. See the script preview to help you envisage how you might do it. Maybe you could just include actors for the main scene maybe of Mary and Joseph, and the ever popular angel parts! Alternatively, maybe just have one or 2 people playing each part and changing tunics, or even have one person wearing a different ‘mask’ for each part! Be as creative as you choose; there is plenty of scope. The Alphabet Nativity Play is perfect for young children who do not want speaking parts. Narrated as an alphabet poem, with 26 printable illustrated letters provided (to be displayed as the play progresses), it can be enacted in mime to the narration if you choose, but more specifically has actions suggested for the 26 keywords of the script which would be perfect for a group of young children to do. The play’s flexibility means that it can be as simple or as detailed as you choose to suit your cast’s age and ability and is great when you include the option of an ‘Action Superstar’ to demonstrate the actions, and an ‘Instructor’ to encourage audience participation. It also includes 9 short optional simple songs (with sheet music and mp3 backing tracks in case you have no pianist) which are perfect for young children, using familiar children’s tunes with my own simple, repetitive (ie, easily remembered) words. 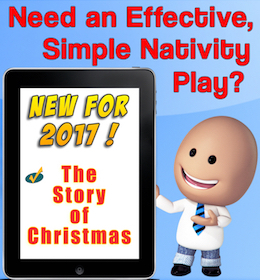 The Simplest Nativity Play Ever (19 optional speaking parts plus angels, narrators, instructor and non-speaking extras as required) All children can mime to narration, or can say their own line if preferred. The script itself includes an instructor as a narrator, who literally instructs the actors as part of the script. No songs are included so that you can use your own favourites, or even include carols for everyone to join in. The following scripts are carried by narration, with lots of small, speaking parts which are ideal for young children as the rhyming makes them easy to remember. Children’s Nativity Story (MOST POPULAR TO DATE) Tells the traditional nativity story, with short speaking parts included, simple songs and lots of gentle humour. Grandpa’s Nativity Story Grandpa tells the traditional nativity story to the excited children on Christmas Eve, thereby providing the introduction to the individual nativity scenes which are enacted with short, rhyming speaking parts. Santa/St Nicholas can be included as an option, and simple songs are again included. Grandpa can be played by a young child (confident reader) for a cute effect, or by an adult for a different effect. The Donkey’s Christmas The story is told from the perspective of the donkey, who is feeling un-noticed and unimportant as he humbly goes on his journey, until he eventually realises that he has been given the most important job of all; carrying God’s unborn child to the place of his birth. A young child would make a very endearing donkey, grumbling that “Hmmmmph. No-one seems to notice me. No-one seems to care. I’m tired and I’ve had to walk right from over there!” The songs are particularly geared towards younger children, but the script can be used with your own choice of songs if preferred. The Day that Baby Jesus Came To Town The play is dominated by the main characters of innkeeper’s wife, innkeeper and narrator so they need to be older, confident children, but the rest of the songs and script are ideal for young children, so I would personally consider this better suited to a mixed age cast. The Day that Baby Jesus Came To Town Songs and parts are included for younger children, but teenagers love the gossiping Innkeeper’s wife’s perspective of the script! The script lends itself to the older main characters carrying the script with their sarcasm and humour, and has real scope for some actors to shine. Your own choice of traditional hymns/carols can be used for older children if preferred. The Alphabet Nativity is narrated entirely as an alphabet poem, whilst 26 illustrated letters are displayed to represent the key alphabetical words that are stressed in the story. This can be done as a simple visual representation of the story told, without any acting or costumes required if you choose to do so, making it a totally unique play. There is also an optional ‘Action Superstar’ who can demonstrate the appropriate actions to each of the keywords, and a fun option of getting the whole audience to participate in doing the actions at speed when a recap poem is read out. A particular favourite optional element for our teenagers (they asked me to write it in especially!) was the Instructor, who interacts with the audience in a pantomime style, getting them to respond as appropriate to elements of the story. Whilst the songs that are included are very much geared to involving the younger children, the play can be shortened to include no songs, or carols can be used for the cast and/or audience to sing. The DIY Nativity Play Our older children/teenagers loved this script as they led the service, all in rhyme, giving instructions to the congregation and coaxing volunteer adults to join in.….the relevant mockery is all scripted too! Just 4 or 5 younger children dressed up to join in with walk on parts, specifically Mary and Joseph. No music is included as the congregation sing hymns of your own choice at the appropriate points. The Donkey’s Christmas is told from the perspective of the donkey on his way to Bethlehem as he grumbles about his humble role in life “No-one seems to notice me, no-one seems to care. I’m tired and I’ve had to walk right from over there”. This can have a really endearing effect when acted by a young child, whilst an older child can add attitude and humour throughout the play until the realisation at the end that he had the most important role of all in carrying God’s unborn son. Songs are included and are appropriate to younger children, but can be substituted for carols or hymns for the congregation to sing at the appropriate moments. I plan to write more scripts that approach the story in a unique way specific to this age group, and am hoping to add them in 2017. In the meantime, all of my scripts lend themselves to being used by a mixed age cast. Problem solved! You have lots of choice: I write all of my scripts with this in mind and include lots of flexibility. The Day that Baby Jesus Came To Town The story is told by the older children acting as the Innkeeper’s Wife and Narrators etc, whilst the younger children play the smaller roles. Simple songs, written with younger children in mind and using familiar children’s tunes are included. Mary and Joseph can be played by young or old as their simple repetitive words provide the sarcasm and humour, as a not so meek Mary chastises Joseph (in rhyme) for not booking ahead etc! The DIY Nativity Play Our 7 older children/ teenagers loved this script as they narrated and led the service, all in rhyme, giving instructions to the congregation and coaxing volunteer adults to join in.….The relevant mockery is all scripted too! The few younger children we had loved their role within the cast of ‘setting the example of how to play the part.’ No music is included with this script as hymns are suggested for the congregation to sing at the appropriate points. Children’s Nativity Story Whilst I wrote this play for children, it is such an effective and adaptable retelling of the Christmas story that it has even been used for an all adult cast. Simple songs, written with younger children in mind and using familiar children’s tunes are included. Grandpa’s Nativity Story Narration and Grandpa’s role have often been performed by adults or older children. The script is flexible enough to cast to suit your circumstances. Simple songs, written with younger children in mind and using familiar children’s tunes are included. The Donkey’s Christmas Play : The songs are geared to infant aged children, but the script will adapt easily to include carols, hymns, or your own songs. The acting could be any age; cute and endearing with a young donkey, and acted with a comic effect by an older one. The Simplest Nativity Play Ever 19 optional speaking parts, plus angels, narrators, instructor and non-speaking extras as required. Any age mix would work with this cast, rehearsed or unrehearsed (the instructions are given to the cast as part of the script). No songs are included, but hymns are suggested for the congregation to sing. The Alphabet Nativity Play: This could be excellent for special needs, mixed abilities or a pre-school cast….literally any mix of ages and abilities. The songs are very much geared towards younger children, while the interaction of the Action Superstar and the Instructor with the audience adds a real comic effect performed by an older child/teenager or even an adult, but would have the ‘cute factor’ when performed by a younger child. The Story of Christmas: This script requires a confident on-stage director (the direction being scripted all in rhyme). The director refers to his/her script as any director would do (disguising the fact that he/she is actual scan reading their lines as they tell the actors on stage what to do, so any age or ability can join in unrehearsed if you like.) The nature of the script means that adults from the congregation can join in without the need for a full rehearsal. Whilst no songs or music is included, hymns are suggested for the congregation to sing at appropriate times. Have some fun: this script is full of scripted sarcasm, attitude and humour…. The Day that Baby Jesus Came To Town Our teenagers loved doing the main narration and acting, particularly because of the gossiping Innkeeper’s wife’s perspective and the humour, attitude and sarcasm that comes through even in Mary and Joseph’s dialogue. There are also characters which will work for a younger cast, making this particularly good for a mixed age cast. The songs are intended for younger children, but the script can be used without songs or with a substitution of your own familiar favourites if you prefer. OR….GET THE CHURCH INVOLVED! The following scripts encourage/allow participation from the congregation or some of it, instead of expecting the nativity to be a pure ‘performance’ from the children. 1. Give the young people a leadership role……..The following script has been well-received in fun-loving churches with a friendly, family atmosphere, and pre-teens in particular love it. 2. Do something completely different and unique…. The Alphabet Nativity Play : VERY, VERY ADAPTABLE TO YOUR CIRCUMSTANCES. The entire script is narrated and pictures representing 26 alphabetical keywords are displayed one at a time as they are mentioned in the script. The script is written with the option of including an ‘instructor’ who gets ‘audience participation pantomime style’, holding signs up for the the audience to say together. There is also an optional ‘Action Superstar’ who does actions to the 26 keywords (illustrated reminders are included on the displayed letters) and the congregation can join in a fun, speedy recap of the actions at the end of the play when the recap poem is read. (Songs are included which are most suited to young people, but congregational hymns/carols can be used instead) This is a fun, unique nativity involving as much participation as you choose, and requiring no acting at all unless you choose to include walk on parts. 3. Don’t leave the nativity to the young people: get the congregation to join in (with or without rehearsal, acting or saying lines in their seats, with or without costume). The following use congregational carols or hymns of your choice instead of the children performing songs, and are literally the most flexible scripts ever…. The Simplest Nativity Play Ever. This is written as a narrated story throughout which obvious prompts are included such as “and the innkeeper said….”etc so a non-rehearsed actor can say their line (using the downloadable script prompt cards provided). Our church loved joining in with the children this way and it enhanced an already lovely, family atmosphere. As few or as little cast can be included as the narrated tells the story and continues with the lines themselves if no actor is included for a part. N.b. At our church, we found that the children didn’t want to ‘perform’, and especially didn’t want to sing songs, so we used congregational hymns/carols in place of the performed songs, and just looked for opportunities for the little ones to sing. Some suggestions are…. Sometimes the children will have some favourites that they already know from school like “It was on a starry night” and you could get them to sing a verse or chorus and then get the congregation to join in. Alternatively, several of my scripts include music (sheet music and mp3 backing tracks) and I deliberately use simple, familiar children’s tunes that young children will know, adding my own easily remembered nativity based lyrics to them. Feel free to mix and match and use elements of one script with another (you can re-use year after year without licence fee), giving you lots of options of ‘performance moments’ for the younger children to be blended into a mixed age nativity. - LITTLE OR NO REHEARSAL TIME? 1…..all of my scripts are written with this in mind, but some even more so than others. Scenes can be practised independently of each other, and the songs are placed so that they give an opportunity to position the relevant cast for the next scene. 2…..some of my scripts include songs using familiar children’s tunes to which I have added my own nativity based lyrics, making them easily remembered and minimising rehearsal. Better still, none of the scripts are reliant on the songs that I have included so this element of rehearsal can be cut out completely if you use hymns/carols for the congregation to sing at the appropriate points in the script, or minimised by using your own familiar favourites. Scripts without songs which simply suggest carols or hymns for the congregation to sing instead….. The Simplest Nativity Play Ever is exactly what it says. It could be performed with a cast that has literally just been gathered together an hour before and given their script prompt cards, without rehearsal! The DIY Nativity Play because of the congregational participation, simply requires a familiarity with the script and clear narration, so very little rehearsal is required. The small cast of young people need minimal rehearsal (more of a familiarity with the script and what happens when) but the script then involves unsuspecting congregation members joining in! This script includes optional songs…..
- NO TIME TO PREPARE? These scripts include each person’s lines ready for you to print off and distribute, and can even be used as script prompts for the performance instead of learning lines. Actors can choose not to say their own lines, and simply act as a walk on part, having their lines be allocated to the narrator or a voice-over so the script continues seamlessly. The Simplest Nativity Play Ever : The narrator tells the bible based nativity story with obvious prompts for individuals to say lines such as “The innkeeper listened while Joseph said….” (Do you have a room and a lovely warm bed). An instructor tells the actors what to do (all in rhyme and rhythm) so that the direction needs little rehearsal. Use the script prompts if you choose, as mentioned above. The Alphabet Nativity : This play is less about acting and more about telling the story with visuals. Hence, 26 key words are included in the story, which is told as an alphabet poem, and as each of them is said (in alphabetical order in the story:A=Angel, B=Beginning of the story, C=Census, D=Donkey etc), an illustrated letter is displayed and the appropriate action is done for that specific keyword. The illustrations act as a prompt for the appropriate actions. These letters are all prepared and ready to be printed onto card, and this is all the preparation time that you would need as there are no lines to distribute to the children, with the exception of the narration and the songs. Of course, if you choose to have the story mimed to the narration, you will need to organise costumes, but the actors aren’t actually necessary as the play has its own unique appeal. - NO PIANIST? NO PROBLEM! HAVE TO PRACTICE WITHOUT THE PIANIST? The above all include mp3 music files to use as backing tracks for the simple songs, as well as sheet music with simple piano music and guitar chords. All of these use congregational hymns/ carols of your own choice, so no music rehearsals are required. - WHICH SCRIPTS INCLUDE SONGS, AND ARE THERE OPPORTUNITIES FOR SOLOS? The Virgin Mary had a Baby Boy (ie, Shepherds’ song called “Shepherd’s Calypso”.) This can include a solo verse by a shepherd for an extra special touch, plus a chorus sung by angels, and a verse for all of the shepherds to sing together. Also included are a couple of songs already known to most children…. Pop Goes the Weasel (ie, Shepherd’s song called “We’re on the Way to Bethlehem”) The shepherd could sing this as a group if you choose. Sing a Song of Sixpence (ie, Kings song called “We’re Looking for a Baby”) The kings could sing this as a group if you choose. Plus, the play begins and ends with my own composition called “The Celebration Song”, a lively, catchy tune with very simple but effective words that the children can easily remember. The Day That Baby Jesus Came to Town : I have used my own easily remembered words to the following popular tunes…. Go Tell it on the Mountain (ie, Angel’s song “Go Find the Baby Jesus”) This would be lovely sung by the angels as a group, and even better if they choose to sing a verse each, for example. Here we go round the Mulberry Bush (ie, Shepherds’ song “This is the Way to Bethlehem”.) If you choose to, the shepherds can sing a solo of a verse each. All of my scripts are deliberately balanced to include lots of small speaking parts, but some are more flexible than others in terms of choosing to omit certain lines if you have anyone shy in your cast who doesn’t want lines. The script previews show the casting list and number of lines allocated to each part, so you will get a feel for how big each part is before you buy. THE FOLLOWING SCRIPTS ARE WRITTEN WITH THE INTENTION OF BEING ACTED OUT AND THE CAST ALL HAVING SMALL SPEAKING PARTS, although options of non-speaking parts as extras is suggested for each of them. Children’s Nativity Story : A lovely, simple retelling of the traditional, bible based nativity story with lots of gentle humour, all told in rhyme and rhythm. Songs are included if you choose to use them. Grandpa’s Nativity Story : Set in an excited child’s bedroom on Christmas Eve as they await the presents on Christmas Day, and Grandpa Joe takes the opportunity to tell them the story that they are actually celebrating. As Grandpa Joe reads the story, the children act out the individual nativity scenes, all in rhyme and rhythm. Optional songs are included. The Donkey’s Christmas : The story of the birth of Jesus told from the humble perspective of a donkey who feels unloved and unnoticed until he realises that God actually chose him to carry His unborn son to his place of birth! A lovely, cute play with a strong message of humility and importance blended together. Optional songs are included. The Day That Baby Jesus Came to Town The innkeeper’s gossiping wife tells the story of the birth of a special baby in her stable, with the help of her diary which gets passed round as the characters interact and comment on her inaccurate memories! Hence, the diary is actually the script so there is no memorising to do, just an ability to scan read and act without it being noticeable. The DIY Nativity play This script is mostly narrated by the young people, while they give instructions to the congregation to join in unrehearsed, with just a few children included in the acting cast as ‘examples’ for the adults to follow! The next 2 scripts can be used with as many or as few actors as you choose (can literally just be narrated if you choose) WITH OR WITHOUT SPEAKING PARTS, WITHOUT THE SCRIPT BEING REDUCED……. The Simplest Nativity Play Ever This needs Mary and Joseph as actors as a minimum, but includes up to 19 speaking parts plus extras and non-speaking parts, BUT if someone doesn’t want to say their own line the narrator or a voice-over can say it for them as part of the story being narrated so the script is not reduced. The Story of Christmas This needs a confident onstage director (part of the script) who actually does the directing using the script , all in rhyme and rhythm (no need to memorise as he does it with constant reference to the script on a clipboard in the same way that a director would do, but is disguising the fact that he is reading his own lines). Other than this, the concept works like the Simplest Nativity Play Ever and rhyming couplets are allocated to each individual, but in such a way that they can choose not to say them themselves and a voice-over or narrator can say their lines as part of the story while they simply have a walk on part. THIS FINAL SCRIPT HAS LITTLE OR NO SPEAKING PARTS OTHER THAN A NARRATOR but does have a really fun optional audience participation element if you choose to include the Instructor’s speaking part….. The Alphabet Nativity The script is written as an alphabet poem which is narrated and includes 26 keywords mentioned in alphabetical order as part of the story. When mentioned, an illustrated letter is displayed and there are some actions for the children to do. Walk on parts can act the play in mime if you choose, without any lines. I highly recommend the use of the optional parts of ‘Instructor’ who encourages ‘audience participation’ pantomime style, and holds signs up with the response of the audience/congregation. It adds a fun, family atmosphere to an already unique and highly visual play. Meanwhile, another optional character is the ‘Action Superstar’ who demonstrates the actions, and the opportunity to get the congregation to join in the actions at speed at the end together. The Alphabet Nativity : includes the option to use a ‘pantomime style’ Instructor who talks to the audience and holds signs up for them to make a response (Hold up sign saying”AH” for audience, followed by the Instructor’s response “You’re really not much good at this! Let’s try another “Ah”…He really is the cutest baby that you’ve seen by far” Hold up sign again “AH”) etc. Also, the ‘Action Superstar’ does actions to the 26 alphabetical specific keywords throughout the play and at the end there is an option for the whole audience to stand and do the actions, at speed, to the recap poem of the story: a real fun moment for everyone. The teenagers of our church specifically requested these two optional characters to be written in and it worked brilliantly. The DIY Nativity : is purpose written for a church nativity service whereby the children/teenager narrators get the adults up from the audience to play specific parts, scripted throughout with mockery and sarcasm. This is a great lighthearted interactive retelling of the nativity story for a church with a fun, family atmosphere, and always receives fabulous feedback. Appropriate hymns/carols are suggested for everyone to sing instead of having songs performed but no music is actually provided. The Simplest Nativity Play Ever : This script can literally be performed without a rehearsal by people who are given a card with their prompt and their lines on it, usually consisting of two rhyming lines. It makes a lovely community event if you are brave enough to attempt it! A scripted instructor tells the actors what to do all in rhyme and rhythm, while the narrator introduces each character with an obvious prompt such as “the innkeeper listened while Joseph said…..” making it simply a case of listening to the narrator and instructor and following their direction. We used this script when we had very few children in our Sunday School so we could include some adults who simply sat on the end of the pews as the innkeepers etc, and it was a great way to get involvement from the whole congregation. The Story of Christmas :A scripted on-stage director carries the script with him/her and constantly refers to it to make notes throughout the performance (in reality they are reading their lines!) The director (must be confident and familiar with the script) therefore instructs all the cast in rhyme and rhythm so they do not all need to be rehearsed, although any rehearsals that you choose to do will make it more smooth running, of course. Meanwhile, some of the characters are written such that people in the audience can say the lines of, for example, the shepherds, simply by standing where they are and reading their lines from the printable script prompt card that is placed on their seat, without any prior sight of the script. Several of these characters are included (see script preview) but you can choose whether to substitute them for an actual actor on stage (appropriate alternatives are offered for both scenarios.) Having used this script in 2015 in our church (I played the director) I have included an example diagram of the way that the church was set out and where everyone sat for our performance. The Shepherds, Innkeepers, Soldier, Caesar, Joseph and Star were all unrehearsed members of the congregation, whilst the kings joined us from a local school and were unfamiliar with the church. It was a blessing for us all. - WANT A SPECIFIC MESSAGE? The Children’s Nativity Story : This script sticks to a fun, relaxed biblical retelling of the birth of Jesus without any specific message other than a simple celebration of the story. The “Full Christmas Story” poem is offered as an additional optional ending to the play and goes on to link the nativity story with the ongoing life and death of Jesus, acknowledging that Christmas is all about God expressing His love for us through Jesus and His choice to come to earth as a man, and to recognise that Jesus is God’s gift to us. Grandpa’s Nativity Story : Don’t get carried away with the excitement of Christmas and forget the real reason for the celebration, Jesus being the very first and most precious gift of all. The Alphabet Nativity : The Alphabet Nativity Play tells the nativity story in rhyme and rhythm as an alphabet poem. The perfect central positioning of the following keywords in the alphabet stresses the message that ‘Jesus, King, Lord, and Messiah’ are literally at the very centre of the Nativity Story, and that the point of Jesus’s birth gave us a ‘New beginning’. The DIY Nativity play : This play specifically highlights the fact that God tells us to share the good news, and not to just leave it to the children to tell it via a nativity once a year. It quotes Matthew 28 verses 19 and 20 at the end. The Day That Baby Jesus Came to Town : Remember the reason why we celebrate Christmas: the birth of Jesus is not just a story, but the real reason for our celebrations at Christmas-time. The free bonus poem “Jesus is not just for Christmas” highlights the message that, whilst Christmas is a lovely time of celebration, we must remember that Jesus is the reason for it, but also that Jesus’s birth was a gift to us from God, not just for Christmas-time but forever. The Story of Christmas : This is simply a retelling of the traditional bible based nativity story, keeping firmly to the details and words as related in the bible, with the exception of following the tradition of the kings visiting the stable instead of a house as per Matthew’s gospel. Option B …….General message: At Christmas-time we need to think beyond the gifts and consider what part we can play in making the world a better place and bringing peace and joy to the earth. The Simplest Nativity Play Ever is also unique in the fact that it keeps so firmly to the biblical accuracy of the nativity story that it even acknowledges the fact that the kings visited Jesus in a house, not a stable (as per Matthew’s gospel reading) but then, as part of the script, agrees to compromise and stick with tradition and use the stable scene anyway, thereby recognising the actual truth of the gospel retelling of the kings’ visit.